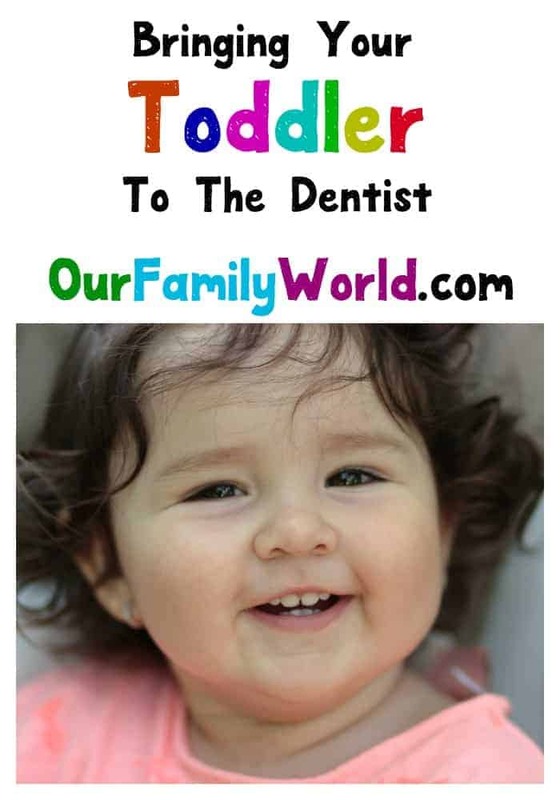 Bringing your toddler to the dentist for the first time is a milestone! I know as a Mom I am obsessive about their teeth; making sure they are clean, are there more coming in, are they coming in too early, you know, typical stuff Moms worry about. My experience at the dentist with my first born was not a great one. One of our Mommy readers was hesitant to bring her son to the dentist, for fear it would be a useless visit (meaning, her child would just clench his jaw shut). So I thought I would share my own experience with my daughter. This is not meant to scare you away from bringing your child to the dentist but hear me out. Related: Brushing 101: Tips for Getting Those Teeth Truly Radiant! I scheduled my daughter her first visit to the dentist. It was a brand new dentist office just built and just opened! Even better? It was specifically designed for children. It was gorgeous! They had a local resident carve bears and moose out of trees, their front desk was a giant slab of wood and they had a train running around the top of the rooms out back. The staff was even better; they were all really nice, helpful and with bubbly personalities. I was excited about our first visit! It was simple, the dentist was going to just do what she called a lap examination. My daughter would sit in my lap, and lean back so the dentist could see in her mouth. She wasn’t going to do any probing around or poking or anything that might scare her, just a mirror and her fingers. My daughter was hesitant and squirmy. Our first visit went ok, so we scheduled another for 6 months out. This is when the dentist did some more poking, prodding and x-rays and discovered she had cavities. And more bad news I didn’t even think was possible. She needed to have oral surgery. She was so little! How were her teeth that bad, her baby teeth, that she needed to have surgery to fix them? It turns out (and to this day, I still don’t know how or why) the backs of her top teeth were decaying, and they were decaying up under the gum. If we let it go, it could damage her adult teeth that weren’t even close to coming in yet. She needed to have all 4 top front teeth capped. I almost cried right there in the office. I waited until I got in the car and called my Mom (yes, I called my Mommy). The day for surgery came. I was nervous. The dentist was taking longer than expected and there was nothing to do but wait. Finally, she came out and explained it all went well, but when she got in her mouth more, she discovered more cavities that needed to be filled. My heart sank. The bright side is that going forward I knew everything was taken care of that needed it, and we were going to be even more diligent about her teeth and what she ate. Needless to say my first visit to the dentist with my baby girl was not a good one. However, I am glad we went! They say as soon as your child has teeth, that a visit to the dentist is a good time to start. I say go for it! He might be too little according to what the norm is, but getting him used to the dentist poking and prodding in his mouth won’t hurt. You might even be able to catch something early and avoid a situation like mine. What age did you start bringing your toddler to the dentist? Share your experience with us below in the comment section! Chosing the right dentist for your children makes a huge difference! My boys’ forest dentist had lots of fish in a tank, a play room, and huge murals on the walls to make it feel like you were under the water. They also had TV screens above the chairs so they could watch cartoons while the dentist was working. Was such a great experience! My girls have been going since 1! Good dental health is SO important for development! These are great tips, I had three kids so I went thru it 3 times. They all did really well. The right dentist helps a lot. I’ve always taken our boys 1-2 times per year for a checkup. I was raised that way being taught regular dental care is important so I did the same with my boys. I love that you found a dentist designed for children. I remember looking forward to going to the dentist as a kid only because they had fun books and toys in the waiting room. Plus sometimes I would get a treat after! Tabatha, I’m grateful that you shared your experience with taking your daughter to the dentist. My sister is scared of how her daughter might react to a visit to a pediatric dentistry. I’m sure she’ll be comforted by your story and will actually go make an appointment.